MileSplit.com Will Be LIVE Streaming DIAA State Indoor Meet! SIGN UP TO WATCH LIVE ON MILESPLIT.COM! MileSplit.com is excited to announce that we will be LIVE streaming the 2019 DIAA State Championships to be held on Saturday, February 2nd at the Prince George's County Sportsplex in Landover, Maryland. This will be the first time that the event will be live streamed on MileSplit.com after providing photo and archived race video coverage of the Delaware state championship series meets in prior years. 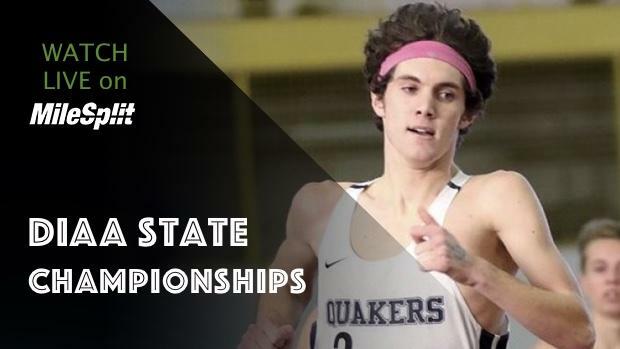 Especially for parents, family, friends, and teammates who cannot make the trip to the meet on February 2nd, the live stream will provide instant viewing of all the action on the track to determine this year's Delaware state champions in indoor track. All races will also be automatically uploaded and archived on the website as well as photo gallery and results. Follow MileSplit Delaware on social media via twitter and facebook for more meet updates. By becoming a MileSplit subscriber for only $48/year (breaks down to $4/month), you will get full access to the LIVE stream as well as the rest of the website's coverage and content.